GRE - powerprep Test 1 - Section 2 - Verbal Reasoning Given how (i)_____ the shortcomings of the standard economic model are in its portrayal of human behavior, the failure of many economists to respond to them is astonishing. Given how (i)_____ the shortcomings of the standard economic model are in its portrayal of human behavior, the failure of many economists to respond to them is astonishing. They continue to fill the journals with yet more proofs of yet more (ii)_____ theorems. Others, by contrast, accept the criticisms as a challenge, seeking to expand the basic model to embrace a wider range of things people do. the student picks the wrong blanks or one correct and one no, it depends. he/she nails the question without any apparent logic or full reasoning of the same. As it turns out, all this boils down to up-front problems, even before to start to read the question itself,: the student is poor or on average in standard English and/or has a vocabulary issue. Actually, make piece by piece the sentence and grasp as much as you can from the meaning conveyed. Given how (i)_____ the shortcomings of the standard economic model are in its portrayal of human behavior, the failure of many economists to respond to them is astonishing. What we do know here: the flaw of the economic model in its standard form to depict the human behavior and the fact the economists are not able to give clear and definitive answers to this is surpising. Even though we do have supercomputers, immense ways of the calculus of almost infinite variable, We are still not able to set up definitive rules as we could do in physic. The relative theory casts rules unchangeable for another thousand years. And they are true and tested on th field (litlle digression). They continue to fill the journals with yet more proofs of yet more (ii)_____ theorems. Another fact following the first statement. We do have tons of research papers to explain which is which without a definitive conclusion on a definitive argument. Others, by contrast, accept the criticisms as a challenge, seeking to expand the basic model to embrace a wider range of things people do. Other economists on the other hand, take the challenge and they try to move further improving our knowledge of a phenomenon, expanding the partial theories we already do set up, til now. Now that we do have a better understanding of what is going on look at the first 3 blanks. - overlooked. we said that the actual economic models are inadequate. As such, overlooked something has no meaning. It is completed out of context. Overlooked means that our models ignore something. This is wrong. They do not miss anything. They are incomplete and their incompleteness is surprising. - occasional means infrequent. No so often. This word bears us something in the overall structure ?' at all. Zero. it has no sense. - patent. our word. At this point you have two possible choices: pick it fast and move one or wait a second, be sure it fits the first part of the sentnce and move on, as well. Either way, it is our choice without think too much about. - comprehensive. The second sentence is related to the first one. The first one says: we lack a good model. Nonetheless, a lot of researchers or scientists fill the knowledge arena with papers after papers without hit the nail on the head. So how the second blank can be comprehensive. They are not comprehensive because they do not provide sufficient and exaustive explanation of a phenomenon. The third sentence instead, on the other hand, says that other scientists are trying to make the comprehension wider than we actually have. - pervasive. Pervasive is something that widely spread across an area. Completely out of scope. - Improbable. The papers we do have NOW is improbable, is difficult, is hard they give the answers we are looking for. They still have improbable theorems that in the end give us almost nothing new or shed little light on what we wanna fully understand. Pick it and move on. The students say: Ohh carcass didn't provide us a good explanation True. However, the student tried to stick out the sentence on his/her own ?? does the student take a course of action ?? Does the student reach an aggressive strategy to dissect the argument as fast as he/she can ?? I guess no. You must attack the spaces. the words. the entire sentence without pause. Incessantly. Aggressive. Like a tank. At the end of the day, was not so tough this question, right ?? does it ?? Can anybody actually explain these instead of just fooling us and rewriting the questions only with the correct answer? Given how patent the shortcomings of the standard economic model are in its portrayal of human behavior, the failure of many economists to respond to them is astonishing. They continue to fill the journals with yet more proofs of yet more improbable theorems. Others, by contrast, accept the criticisms as a challenge, seeking to expand the basic model to embrace a wider range of things people do. Guys. This is an Offical question from powerprep. Moreover, the explanation provided is crystal clear. Ask if you need further assistance, do not just quote. From it, anybody can infer what are you looking for. Carcass, Shekhar Ravi has actually requested for an explanation but your supposed explanation was to just rewrite the question and insert the correct answers. The thought process surrounding why Patent and Improbable are the answers were not given. If you can pen the thought process getting these answers, please do. "Overlooked" doesn't quite work here, because that first sentence goes on to say that "the failure of many economists to respond to them" (then=the shortcomings) "is astonishing." "Astonishing" means surprising and unexpected. But if the economists had overlooked the shortcomings, than their failure to respond to the shortcomings would not be astonishing. In fact, if someone has overlooked something-- failed to notice it-- then they CAN'T respond to it, because they don't know it's there. Let us tackle this problem sentence by sentence, as the sentences all convey one single idea. But it also helps to keep in mind the overall meaning of the passage. Now we know that the failure of the economists to respond to the shortcomings of the economic model was considered astonishing. Now what kind of shortcomings could make the failure to respond to them astonishing? My own word would be obvious. If the shortcomings were obvious or glaring and the economists still did not respond (and point them out), it would be considered an astonishing thing indeed. Now overlooked does not mean obvious, neither does occasional mean obvious. So patent is the correct choice. So we can say that the others are realistic, as they accept the criticisms as a challenge, and they even seek to expand the basic mmodel...(more realistic behaviour). And this is contrasted to the behaviour of the economists who failed to respond. So we can say their theorems were unrealistic or castles in the air. Among the chocies, only improbable conveys such an idea. Therefore we select it. 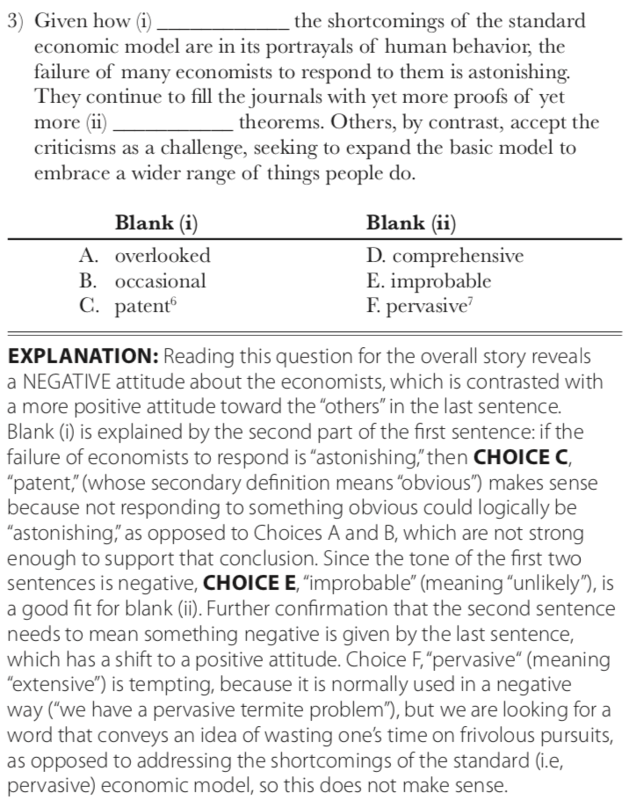 For blank (i), I asked myself "What type of 'shortcomings' would economists fail to see that could be astonishing?" If its "overlooked" then it wouldn't be astonishing, it would be natural for many economists to fail to respond to it. So we can cancel 'overlooked' out. 'occasional' works, but 'patent' (glaringly obvious) works better. The wording for this is tricky. Even a native English speaker could have trouble with this. The wording of the second sentence is just as confusing as the first one. The last sentence is there just to confuse, so it's best to ignore.